A Jamaican recipe that is usually served with white rice or ground provisions. 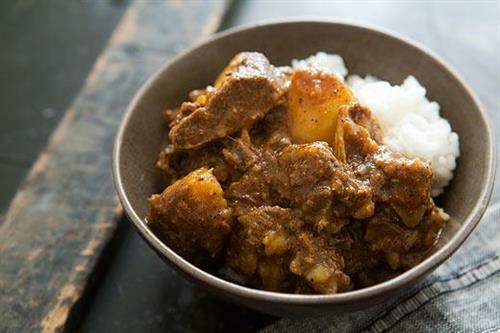 The taste of goat meat cannot really be compared to anything else, but be assured that the taste of the JCS authentic curry powder to this recipe, will remove all doubts from the mind of the "new" taster. Wash goat meat with vinegar. Rub in all the seasonings and let it sit in the refrigerator for an hour. In a saucepan, heat the oil on high. Add 1 oz. curry powder to the hot oil. Stir curry powder in oil until the color starts to change. Add meat then stir it in the hot oil for two minutes; be careful not to burn the meat. Lower heat to medium and add 2 cups of water and let this stew simmer for 20 minutes. Check on the meat in the pot, stir again and add water to cover the meat. Simmer for another 20 minutes, and then check to see if the meat is medium soft. If it is so, add the seasoning you removed earlier to the pot. Let the stew simmer for another 15 minutes on a slightly lower heat. (Optional) You can add potatoes to the pot the same time you add the seasoning. You can also add bread crumbs to thicken.